Image caption Could bleach be a new skin treatment? Diluted household bleach may be able to treat some skin diseases and may even have a role in slowing ageing, animal research suggests. 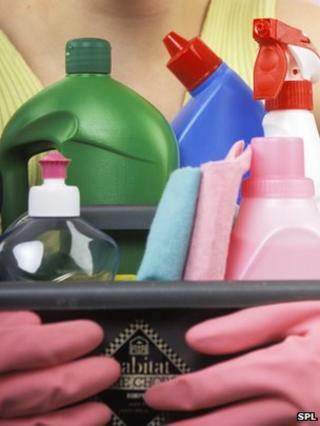 A study, published in the Journal of Clinical Investigation, showed bleach calms inflammation. The team at Stanford University say bleach has potential for treating dermatitis caused by radiotherapy, bed sores and diabetic ulcers. Experts warned patients not to apply bleach directly to their skin. Baths in 0.005% bleach can already be used as a treatment for eczema, but exactly how they work is uncertain. Some bacteria on the skin are killed. However, researchers as Stanford University Medical Centre in California showed bleach was also interfering with the immune system. Inflammation is a natural part of the immune response to infection, yet it can get out of hand. Initial tests on skin cells showed that low doses of bleach could block a chemical that triggers the immune system's inflammatory response. In tests on mice, bleach baths could reduce the damage caused by exposure to radiation. Radiotherapy during cancer treatment destroys the target tumour, but can also lead to large, sore, red areas on the skin akin to sunburn. "We showed that a simple bath ameliorates the nasty effects of radiation injury," dermatologist Dr Thomas Leung told the BBC. He said the treatment had potential in other inflammatory skin diseases, including diabetic ulcers and bed sores and would be cheap. "There's no treatment for these conditions and they affect tons of people. "I can't say it is going to work, but this is a clinical treatment that we didn't quite understand, we've applied it in mice and other diseases and we hope to translate it back into humans shortly." Further experiments on old mice suggested that bleach was also making the skin younger. After two weeks of bleach baths, the mice developed thicker skin and showed signs of more skin cells being produced. However, this was seen only under a microscope. The mice did not appear younger. Dr Graham Johnston, of the British Association of Dermatologists, said inflammatory skin conditions were "extremely common". "Although dilute bleach baths are not commonly used in the UK, this research opens up the potential for new clinical treatments in the future. "However, it is worth noting that this research is just the beginning, and although the science is sound, there are yet to be human clinical trials. "Though dilute bleach baths can be used to treat eczema, it is important to discuss treatment options with your dermatologist first. "I cannot emphasise enough that it is very important that individuals with inflammatory conditions do not apply bleach directly to their skin. We often see patients with severe reactions to even mild bleaches, and I would recommend that people with inflamed or broken skin avoid contact with bleach in those areas."